Lexie was just a day shy of turning 6 months old. She had just figured out how to crawl, and was on the move. She was playing on the floor, and kept pushing that ball around. I was preoccupied with Dylan, but I kept glancing over at her. 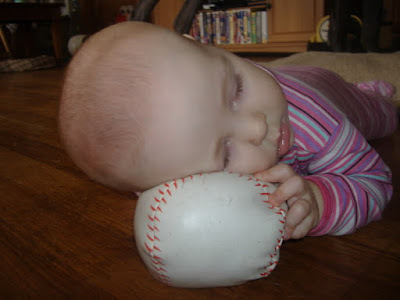 Once I realized she wasn't moving around anymore, I walked over and found her fast asleep on the ball. Crawling is tough work! This started off the trend of falling asleep in odd locations. She actually slept through a wedding reception last year, even though she was directly in front of a blaring loudspeaker. It runs in the family, though. I have picture after picture of Dylan falling asleep while climbing off the couch, and numerous pictures of them both falling asleep at meals. What can I say? My kids love to sleep. Especially on baseballs. At least it was soft! That gives all new meaning to the word "Softball", now doesn't it? Oh how I wish I could sleep this well!! Kids just don't know how good they have it do they?! too precious!! and thanks for stopping by!! 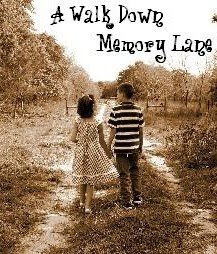 Thanks for stopping by my Memory Lane post to say “Hello”!